ATP is a fast transmitter in sympathetic ganglia and at the sympathoeffector junction. In primary cultures of dissociated rat superior cervical ganglion neurons, ATP elicits noradrenaline release in an entirely Ca2+-dependent manner. 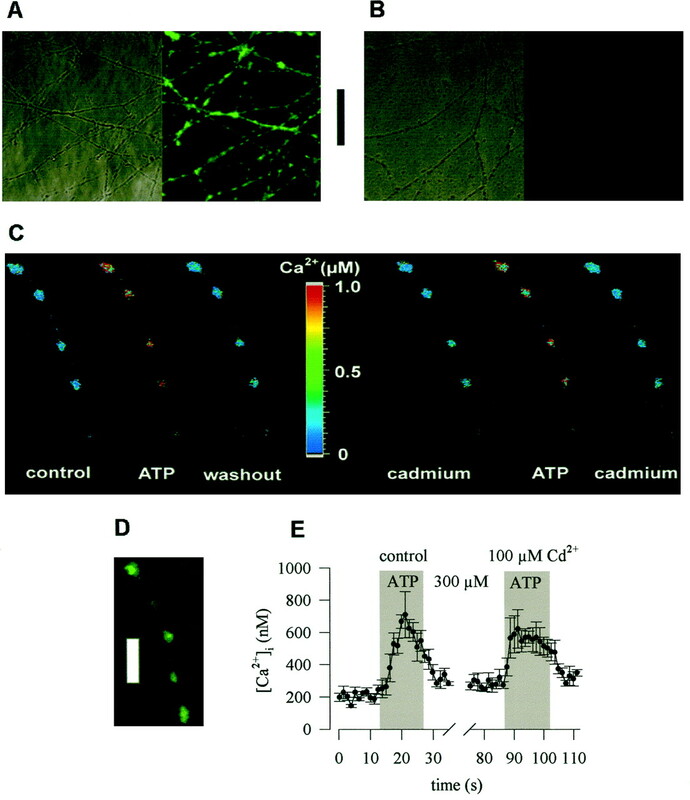 Nevertheless, ATP-evoked noradrenaline release was only partially reduced (by ∼50%) when either Na+ or Ca2+channels were blocked, which indicates that ATP receptors themselves mediated transmembrane Ca2+ entry. An “axonal” preparation was obtained by removing ganglia from explant cultures, which left a network of neurites behind; immunostaining for axonal and dendritic markers revealed that all of these neurites were axons. 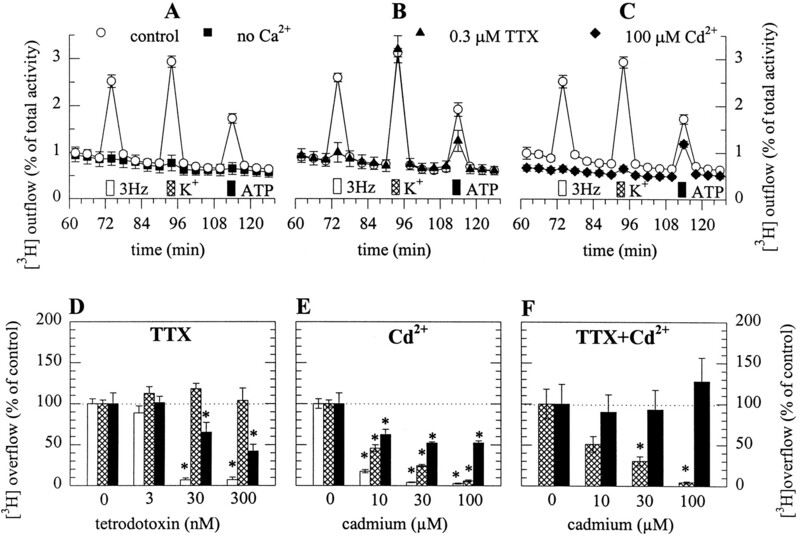 In this preparation, ATP raised intraaxonal Ca2+ and triggered noradrenaline release, and these actions were not altered when Ca2+ channels were blocked by Cd2+. Hence, Ca2+-permeable ATP-gated ion channels, i.e., P2X purinoceptors, are located at presynaptic sites and directly mediate Ca2+-dependent transmitter release. These presynaptic P2X receptors displayed a rank order of agonist potency of ATP ≥ 2-methylthio-ATP > ATPγS ≫ α,β-methylene-ATP ≈ β,γ-methylene-l-ATP and were blocked by suramin or PPADS. ATP, 2-methylthio-ATP, and ATPγS also evoked inward currents measured at neuronal somata, but there these agonists were equipotent. Hence, presynaptic P2X receptors resemble the cloned P2X2 subtype, but they appear to differ from somatodendritic P2X receptors in terms of agonist sensitivity. Suramin reduced depolarization-evoked noradrenaline release by up to 20%, when autoinhibitory mechanisms were inactivated by pertussis toxin. These results indicate that presynaptic P2X purinoceptors mediate a positive, whereas G-protein-coupled P2Y purinoceptors mediate a negative, feedback modulation of sympathetic transmitter release. The release of neurotransmitters from nerve terminals is controlled by a variety of receptors linked to G-proteins. Via such presynaptic receptors, inhibitory, such as GABA, and excitatory neurotransmitters, such as glutamate, reduce transmitter release (Wu and Saggau, 1997; Miller, 1998). In addition, nerve terminals possess ionotropic receptors (McGehee and Role, 1996;Miller, 1998). Depending on the ion selectivity, these presynaptic receptors either promote or inhibit transmitter release. Accordingly, GABA was found to reduce transmitter release by opening the chloride channels of GABAA receptors (Takeuchi and Takeuchi, 1966), whereas glutamate stimulates release via activation of NMDA receptors (Liu et al., 1997). ATP is well established as a fast excitatory neurotransmitter acting via ionotropic P2X receptors. Currently, at least seven types of P2X receptors have been characterized by molecular cloning (North and Barnard, 1997; Soto et al., 1997). Like other neurotransmitters, such as glutamate or acetylcholine, ATP activates not only ionotropic receptors, but also metabotropic G-protein-coupled receptors, which are classified as P2Y (North and Barnard, 1997). In accordance with the general concept of metabotropic and ionotropic presynaptic receptors, P2Y purinoceptors inhibit transmitter release in central as well as peripheral neurons (Koch et al., 1997; von Kügelgen et al., 1993). However, evidence for release-modulating presynaptic P2X purinoceptors has been lacking. While this work was in progress, a first example of presynaptic P2X receptors that enhance glutamate release was described in sensory neurons (Gu and MacDermott, 1997). In rat superior cervical ganglia (SCG), ATP is released from presynaptic sites (Vizi et al., 1997) and may act on two different types of excitatory nucleotide receptors located at the somatodendritic region of postsynaptic neurons (Connolly et al., 1993). Activation of each of these two receptors triggers noradrenaline release from SCG neurons (Boehm, 1994; Boehm et al., 1995). One of these receptors is an ATP-gated ion channel, i.e., a P2X purinoceptor, whereas the other receptor is linked to G-proteins and causes inhibition of muscarinic K+ channels (KM; Boehm, 1998). Thus, in sympathetic ganglia, ATP acts like acetylcholine, which excites postsynaptic neurons first via opening of cation channels of nicotinic receptors and then through the inhibition of KMchannels via muscarinic receptors (Brown, 1983). Recently, we found that rat SCG neurons possess presynaptic nicotinic receptors, which themselves mediate transmembrane Ca2+ entry and thereby stimulate noradrenaline release (Boehm and Huck, 1995). Given the similarity between ATP and acetylcholine as ganglionic transmitters (see above), I reasoned that these sympathetic neurons might also express presynaptic ionotropic receptors for ATP, i.e., presynaptic P2X receptors. Preliminary evidence for the existence of presynaptic P2X purinoceptors on sympathetic nerve terminals has been obtained in immunocytochemical experiments with an antibody directed against the P2X2 receptor subunit; this antibody caused neurite staining in sympathetically innervated tissues, such as the rat vas deferens (Vulchanova et al., 1996). The present results demonstrate that sympathetic neurons are equipped with functional presynaptic P2X receptors that may mediate a positive feedback control of sympathoeffector transmission. Dissociated and explant cultures of rat superior cervical ganglion neurons. Primary cultures of dissociated SCG neurons from neonatal rats were prepared as described before (Boehm, 1994). Briefly, ganglia were dissected from 2- to 6-d-old Sprague Dawley rat pups, cut into three to four pieces and incubated in collagenase (1.5 mg/ml; Sigma, Vienna, Austria; catalog #9891) and dispase (3.0 mg/ml; Boehringer Mannheim, Vienna, Austria; catalog #165859) for 20 min at 36°C. Subsequently, the ganglia were trypsinized (0.25% trypsin; Worthington, Freehold, NJ; catalog #3703) for 15 min at 36°C, dissociated by trituration, and resuspended in DMEM (Life Technologies, Gaithersburg, MD; catalog #041-01885M) containing 2.2 gm/l glucose, 10 mg/l insulin, 25000 IU/l penicillin, and 25 mg/l streptomycin (Life Technologies, catalog #043-05140D), 10 μg/l nerve growth factor (Life Technologies, catalog #0436050), and 5% fetal calf serum (Life Technologies, catalog #011-0620H). Thereafter, the cells were plated onto 5 mm disks coated with rat tail collagen (Biomedical Technologies) for superfusion experiments and onto 35 mm culture dishes (Nunc, Roskilde, Denmark; catalog #153066) coated with poly-d-lysine (Sigma; 25 mg/l) for electrophysiological experiments. To obtain explant cultures, ganglia were desheathed, cut into two halves, and each half was placed onto a glass coverslip (3 cm diameter) coated with laminin (10 μg/ml overnight; Collaborative Biomedical Products) in 1 ml of the above medium lacking fetal calf serum. The medium was then reduced to 0.7 ml, which was sufficient to just cover the coverslip and the half ganglion. After ∼20 hr, medium and fetal calf serum were added to give 1 ml medium with 5% serum. All cultures were kept in a humidified 5% CO2 atmosphere at 36°C for 3 d. In explant cultures, the ganglia containing the cell bodies were removed before experiments to obtain a preparation with neurites devoid of neuronal somata. Measurement of [3H]noradrenaline release. [3H]noradrenaline uptake and superfusion were performed as described (Boehm, 1994). Culture disks with dissociated neurons were incubated in 0.05 μm[3H]noradrenaline (specific activity, 71.7 Ci/mmol) in culture medium supplemented with 1 mm ascorbic acid at 36°C for 1 hr. After labeling, culture disks were transferred to small chambers (volume, 0.2 ml) and superfused with a buffer containing (in mm) NaCl 120, KCl 3.0, CaCl22.0, MgCl2 2.0, glucose 20, HEPES 10, fumaric acid 0.5, Na-pyruvate 5.0, and ascorbic acid 0.57, adjusted to pH 7.4 with NaOH. Superfusion was performed at 25°C at a rate of ∼1.0 ml/min. Collection of 4 min superfusate fractions was started after a 60 min washout period to remove excess radioactivity. To compare ATP-evoked with other types of stimulation-evoked noradrenaline release, [3H] overflow was induced by the application of electrical fields (90 monophasic rectangular pulses, 0.5 msec, 3 Hz, 50 mA, 50 V/cm−1) after 72 min, of 50 mm KCl (NaCl was reduced accordingly) after 92 min, and of 300 μm ATP after 112 min of superfusion. All types of stimulation lasted for 30 sec. Modulatory agents, such as tetrodotoxin (TTX) or CdCl2, were added to, or extracellular Ca2+ was removed from, the medium after 50 min of superfusion (i.e., 10 min before the start of sample collection). The buffer then remained unchanged until the end of experiments. To investigate the effect of suramin on electrically evoked release, cultures were stimulated twice (after 72 min, S1, and after 92 min, S2) with 180 pulses (0.5 msec, 50 mA, 50 V/cm) at 3 Hz, and suramin (30 μm) was added to the buffer 8 min before the second stimulation. Because continuous superfusion of monolayer cultures prevents autoregulatory modulation of neurotransmitter release (Boehm et al., 1991), superfusion was stopped for the period of electrical field stimulation. At the end of experiments, the radioactivity remaining in the cells was extracted by immersion of the disks in 2% (v/v) perchloric acid followed by sonication. Radioactivity in extracts and collected fractions was determined by liquid scintillation counting (Packard Tri-Carb 2100 TR). Radioactivity released in response to electrical field stimulation from rat sympathetic neurons after labeling with tritiated noradrenaline under conditions similar to those of the present study had previously been shown to consist predominantly of the authentic transmitter and to contain only small amounts (≤15%) of metabolites (Schwartz and Malik, 1993). Hence, the outflow of tritium measured in this study was assumed to reflect the release of noradrenaline and not that of metabolites. The spontaneous (unstimulated) rate of [3H] outflow was obtained by expressing the radioactivity of a collected fraction as percentage of the total radioactivity in the cultures at the beginning of the corresponding collection period. Stimulation-evoked tritium overflow was calculated as the difference between the total [3H] outflow during and after stimulation and the estimated basal outflow, which was assumed to decline linearly throughout experiments. Therefore, basal outflow during periods of stimulation was assumed to equate the arithmetic mean of the samples preceding and those after stimulation, respectively. The difference between the total and the estimated basal outflow was expressed as a percentage of the radioactivity in the cultures at the beginning of the respective stimulation (S%). Effects of modulatory agents on the overflow evoked by the various secretagogues were evaluated by expressing S% values obtained in the presence of these modulators as percentage of the corresponding control values. The effect of suramin on electrically evoked tritium overflow was evaluated by comparing the ratio of radioactivity released during two periods of stimulation (S2/S1) with suramin added before S2 with that obtained under control conditions. Axonal preparations, i.e., explant cultures devoid of neuronal somata, were labeled with [3H]noradrenaline as described above. Thereafter, the cultures were washed three times and subsequently incubated for four 15 min periods at ambient temperature (20–24°C) in the buffer used for superfusion experiments (see above). Then, the cultures were incubated for five 1 min periods, and ATP (300 μm) or K+ (50 mm; Na+ was reduced accordingly) were present during the third incubation period. Supernatants were collected, cultures were extracted (as above), and radioactivity was determined by liquid scintillation counting. Determination of intraaxonal Ca2+.Measurements of intracellular Ca2+ concentrations were performed as described before (Boehm et al., 1997). Briefly, explant cultures on glass coverslips were incubated in culture medium containing 2% bovine serum albumin (instead of serum) and 5 μm fura-2 AM for 30 min at 36°C in 5% CO2. Thereafter, the ganglia were removed, and the coverslips carrying the axonal cultures were transferred to a coverslip chamber (Adams & List), which was placed on an inverted microscope (Nikon Diaphot 300). The cultures were washed with and incubated in the same buffer as used for superfusion experiments (see above). Drugs were applied via a gravity-driven six-barrel needle device capped by a glass capillary with a tip diameter of ∼200 μm. This tip was placed in close proximity (<300 μm) to the axons under investigation to permit a complete exchange of the solutions surrounding these neurites within <1 sec. Changes in intracellular Ca2+ concentrations were determined in single axons by the two-wavelength method (Grynkiewicz et al., 1985) with excitation at 340 and 380 nm, and emission at 500 nm, where increases in the ratio of the fluorescence signal obtained with excitation at 340 and 380 nm (F340/F380), respectively, reflect rises in the Ca2+concentration. TheF340/F380 ratio was transformed into Ca2+ concentration by the equation of Grynkiewicz et al. (1985) with Rminand Rmax parameters obtained from a calibration with fura-2 and Ca2+ calibration buffers (Molecular Probes, Eugene, OR). Excitation was performed with light from a 100 W xenon lamp (Nikon), which was directed via appropriate excitation filters, a dichroic mirror, and a Nikon Fluor 100×/1.3 oil immersion objective to the sample. Images of fluorescence signals were registered via an intensified CCD camera (Photonic Sciences). Positioning of the excitation filters in a filterwheel with a stepping motor and registration of images once in a second was controlled by the QuantiCell 700 software (version 1.7; Applied Imaging). The ratioF340/F380 was registered on-line and was subsequently averaged (off-line) over selected areas of single axons and transformed into Ca2+ concentrations. Electrophysiology. Experiments were performed at room temperature (20–24°C) on the somata of neurons after 3 din vitro, using the whole-cell mode of the patch-clamp technique (Hamill et al., 1981) as described (Boehm and Betz, 1997). The internal (pipette) solution contained (in mm) KCl 140, CaCl2 1.59, EGTA 10, and HEPES 10, adjusted to pH 7.3 with NaOH. The bathing (extracellular) solution contained (in mm) NaCl 140, KCl 6.0, CaCl2 2.0, MgCl2 2.0, glucose 20, and HEPES 10, adjusted to pH 7.4 with NaOH. ATP and all other drugs were applied via a DAD-12 drug application device (Adams & List). This superfusion system delivers buffers from 12 reservoirs under pressure (200–400 mmH2O) via a capillary with an inner diameter of ∼100 μm and permits a complete exchange of solutions surrounding the cells under investigation within <100 msec (Boehm and Betz, 1997). Currents were induced every 30 sec by the application of ATP or analogs and were quantified by measuring peak current amplitudes. ATP-induced currents in the presence of various antagonists were compared with control currents recorded before the application of antagonists that were always preapplied before ATP. Immunocytochemistry. Cultures were fixed in 3% paraformaldehyde in PBS for 20 min, rinsed, incubated in 50 μg/ml digitonin for 10 min, and rinsed again. The permeabilized cultures were first incubated for 10 min in PBS containing 2% (v/v) fetal calf serum and then for 30 min in the same buffer containing the following antibodies: SMI32 (1:1000; Biotrend, Cologne, Germany) directed against nonphosphorylated forms of neurofilament H (Sternberger and Sternberger, 1983); PC1C6 (5 μg/ml; Boehringer Mannheim) directed against the tau-1 protein; SY38 (1 μg/ml; Boehringer Mannheim) directed against synaptophysin. After thorough rinsing, the cultures were reacted for 30 min with fluorescein-labeled goat anti-mouse IgG (20 mg/ml; Boehringer Mannheim). Transmission as well as fluorescence images were registered with a Zeiss laser scanning microscope and stored digitally. Statistics. Results are presented as arithmetic mean ± SEM values; n = number of cultures in release experiments, of neurites in Ca2+ imaging experiments, and of single cells in electrophysiological experiments. Differences between data points were evaluated by the unpaired Student’s t test. Concentration–response curves were fitted to experimentally obtained data by the Allfit program (DeLean et al., 1978), which also determines differences between individual concentration–response curves by simultaneous fitting with shared parameters and subsequent calculation of the F statistic on the resulting “extra sum of squares”. Materials. (minus)-[Ring-2,5,6-3H]noradrenaline was obtained from NEN (Dreieich, Germany); Na2-ATP, Na-ADP, Na-UDP, adenosine-5′-O-(3-thiotriphosphate) (ATPγS), CdCl2, and TTX from Sigma; Na4-2-methylthio-ATP, Li2-α,β-methylene-ATP, Na4-β,γ-methylene-l-ATP, Na6-suramin, and Na4-pyridoxalphosphate-6-azophenyl-2′,4′-disulphonic acid from Research Biochemicals (Natick, MA); fura-2 AM from Molecular Probes; and bulk chemicals were from Merck (Vienna, Austria). Primary cultures of dissociated rat SCG neurons loaded with [3H]noradrenaline steadily released small amounts of radioactivity into the superfusion buffer. The spontaneous release of radioactivity per 4 min collection period amounted to 0.74 ± 0.04% of cellular tritium, which corresponded to 0.27 ± 0.02 nCi (n = 18). To investigate the mechanisms of ATP-induced noradrenaline release (Boehm, 1994), three different stimulation paradigms were compared: (1) electrical field stimulation (0.5 msec pulses at 3 Hz) to trigger action potentials; (2) 50 mmK+, to depolarize the neuronal membrane to activate voltage-gated Ca2+ channels; and (3) 0.3 mm ATP to activate P2 purinoceptors. These stimulation paradigms elicited comparable amounts of tritium overflow, which was abolished when Ca2+ was omitted from the superfusion buffer (Fig. 1A). Electrically evoked overflow was reduced by TTX in a concentration-dependent manner, and complete inhibition was achieved at 0.3 μm (Fig. 1B,D), which confirms the involvement of Na+-dependent action potentials. Ten to one hundred micromolar Cd2+, which blocked voltage-gated Ca2+ channels (Kasai and Neher, 1992), but not ATP-gated ion channels (Nakazawa and Hess, 1993), also reduced overflow caused by electrical field stimulation (Fig.1C,E). K+-induced tritium overflow was not affected by TTX (Fig.1B,D), but reduced and finally abolished by increasing concentrations of Cd2+ (Fig.1C,E). ATP-evoked overflow was reduced by both TTX and Cd2+, but the maximum of inhibition amounted to ∼50% in both cases (Fig. 1B–E). In the continuous presence of TTX (0.3 μm), Cd2+ failed to further reduce ATP-induced overflow (Fig. 1F). Hence, ATP triggers noradrenaline release via two mechanisms, one being TTX- and Cd2+-sensitive, the other one being TTX- and Cd2+-insensitive. In the presence of Cd2+, ATP must have elicited transmembrane Ca2+ entry independently of voltage-activated Ca2+ channels. Because ATP-gated ion channels of rat SCG neurons are highly Ca2+ permeable (Rogers et al., 1997), it was most probably the ATP receptors themselves that mediated the Ca2+ influx required for noradrenaline release. ATP-evoked noradrenaline release from SCG neurons is entirely Ca2+-dependent, but partially TTX- and Cd2+-resistant. After loading with [3H]noradrenaline, neurons were superfused, and subsequent to a 1 hr washout period, 4 min fractions of superfusate were collected. After 72 min of superfusion, 90 electrical pulses were delivered, after 92 min, 50 mmK+ (Na+ was reduced accordingly) was applied for 30 sec, and after 112 min, 0.3 mm ATP was present for 30 sec. In cultures depicted by filled symbols, Ca2+-free buffer was supplied (A) and either 0.3 μm TTX (B) or 100 μmCd2+ (C) were present in Ca2+-containing buffer, all from 50 min of superfusion onward. The outflow of tritium is shown as percentage of the total radioactivity in the cultures; n = 6.D, Concentration dependence of the inhibition of electrically (open bars), K+(hatched bars)-, and ATP (filled bars)-evoked tritium overflow by TTX; n = 6. E, Concentration dependence of the inhibition of electrically (open bars), K+(hatched bars)-, and ATP (filled bars)-evoked overflow by Cd2+;n = 6. F, Concentration dependence of the inhibition of K+ (hatched bars)- and ATP (filled bars)-evoked overflow by Cd2+ in the continuous presence of TTX, which was added to the buffer after 50 min of superfusion;n = 6. 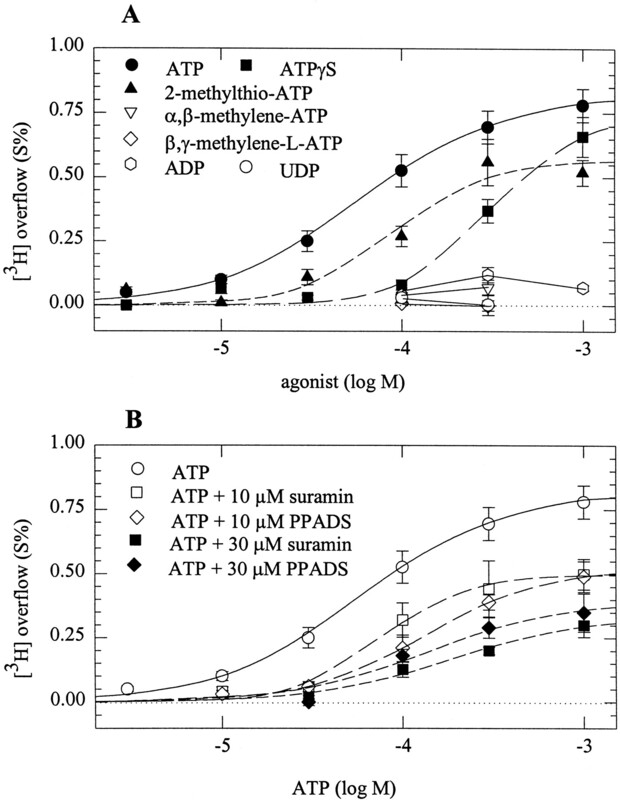 Asterisks indicate significant differences versus corresponding controls atp < 0.05. In primary cultures of dissociated sympathetic neurons, noradrenaline release occurs at axons and axon terminals, but not at neuronal somata (Przywara et al., 1993; Koh and Hille, 1997). To investigate whether ATP can raise intraaxonal Ca2+independently of voltage-gated Ca2+ channels, I prepared explant cultures, which after 3 d in culture had extended numerous neurites. Dissociated rat SCG neurons in vitro form only a few and short, if any, dendrites (Lein et al., 1995). Likewise, the neurites in explant cultures were axons as evidenced by the following immunocytochemical experiments. Neurites were tested with a monoclonal antibody directed against the nonphosphorylated form of the H neurofilament (SMI 32) as a dendritic marker (Sternberger and Sternberger, 1983), and with an antibody directed against the tau protein (PC1C6) as an axonal marker (Lein et al., 1995). The neurites in explant cultures were clearly stained by PC1C6 (Fig.2A), but not by SMI 32 (Fig. 2B). In cultures of dissociated SCG neurons, however, SMI32 clearly stained neuronal somata (data not shown, but seeLein and Higgins, 1989). Characterization of “axonal” preparations and ATP-induced Ca2+ entry into axonal varicosities. Explant cultures of SCG were prepared as described in Materials and Methods. A shows a transmission and an indirect immunofluorescence image of the neurite network in such cultures probed with the monoclonal antibody PC1C6 directed against the tau protein.B displays a similar picture after staining with antibody SMI32 directed against the nonphosphorylated form of neurofilament H. The bar between A andB represents 50 μm. In C, an explant culture was loaded with fura-2 AM, and the ganglion was removed, leaving only the axonal network behind. ATP was applied to the axon shown in either the absence (left) or presence (right) of 100 μm Cd2+. The picture displays the pseudocolour representation of the ratio of fluorescence intensity obtained at excitation wavelengths of 340 and 380 nm and the according values of Ca2+concentrations. D shows indirect immunofluorescence of a neurite in an explant culture probed with anitbody SY38 directed against the vesicle protein synaptophysin. The barrepresents 10 μm. E shows the time course of Ca2+ concentrations averaged for the four axonal varicosities shown in C.
Furthermore, the axons formed in explant cultures were equipped with numerous release sites as confirmed by staining with an antibody (SY38) directed against the vesicle protein synaptophysin (Wiedenmann and Franke, 1985): this antibody caused punctate staining of axons with the punctae being located along mostly invisible lines (Fig.2D). These fluorescent dots most likely represent axonal varicosities, the presynaptic specializations of sympathetic neurons (Hirst et al., 1992). Before Ca2+ measurements with the Ca2+ indicator fura-2, the ganglia containing the somata were removed from the explant cultures, and this manipulation produced a pure axonal preparation. After labeling with fura-2 AM, a punctate fluorescence pattern could be observed which was similar to the staining obtained with SY38 (Fig. 2C,D). Application of 0.3 mm ATP caused marked increases in intraaxonal Ca2+, as detected by changes in the 340/380 ratio of the fura-2 fluorescence signal (Fig. 2C). Furthermore, the ATP triggered rise in intraaxonal Ca2+ was reproducible in the presence of Cd2+ (Fig. 2C,E). The ATP-induced rise in intraaxonal Ca2+ was concentration-dependent with half maximal effects at 34 ± 13 μm (Fig. 3A). 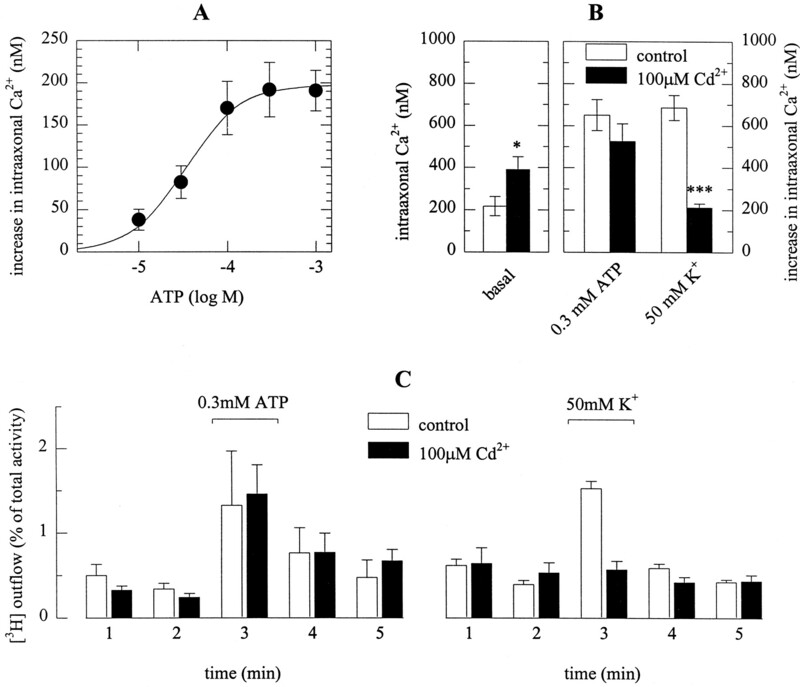 Fifty millimolar K+ also caused increases in intraaxonal Ca2+, and the extent of K+-evoked rises in Ca2+concentrations was comparable to that evoked by maximally active ATP concentrations, such as 0.3 mm (Fig. 3B). In the presence of 100 μm Cd2+, basal levels of intraaxonal Ca2+ were slightly, but significantly enhanced, and the K+-evoked rise was largely reduced. In contrast, the ATP-induced increase in intraaxonal Ca2+ was not altered in the presence of Cd2+ (Fig. 3B). Thus, the ATP-induced rise in intraaxonal Ca2+ was independent of voltage-activated Ca2+ channels. The ATP-triggered rise of Ca2+in, and noradrenaline release from, sympathetic axons is Cd2+-resistant. Explant cultures were labeled with fura-2 AM, and experiments were performed as described in the legend to Figure 2. A shows the averaged concentration–response relation for the ATP-induced rise in intraaxonal Ca2+ concentrations as determined in 22–25 neurites. B depicts basal intraaxonal Ca2+ concentrations (left) and the rises in Ca2+ concentrations (right) evoked by either 0.3 mm ATP or 50 mmK+ (Na+ was reduced accordingly) in 13 neurites. Open bars represent control conditions, whereas filled bars represent experiments performed in the presence of 100 μm Cd2+; *p < 0.05 and ***p < 0.001 versus corresponding controls. The results in A andB have been obtained in different preparations.C shows tritium outflow from axonal preparations labeled with [3H]noradrenaline. After a 1 hr washout period, cultures were incubated for 1 min periods in buffer containing either no (open bars) or 100 μm(filled bars) Cd2+. During the third incubation period, 0.3 mm ATP (left) or 50 mm K+ (Na+ was reduced accordingly; right) were present;n = 5–8. Tritium outflow was also investigated in the axonal preparations described above, by incubating the coverslips carrying the axons in buffer for 1 min periods. Inclusion of both 0.3 mm ATP and 50 mm K+ in the buffer caused significant increases in tritium outflow from the axons. In the presence of 100 μm Cd2+, neither spontaneous outflow of tritium nor the ATP-induced overflow were changed, whereas K+-dependent release was abolished. This corroborates the conclusion that ATP may cause Ca2+ entry at the sites of noradrenaline release independently of voltage-gated Ca2+ channels. SCG neurons contain transcripts for four subtypes of P2X receptors (P2X1, P2X2, P2X4, and P2X6; Collo et al., 1996). Heterologously expressed P2X receptors have been characterized by their agonist and antagonist sensitivities (Evans et al., 1995; Buell et al., 1996; Collo et al., 1996; Le et al., 1998). To characterize the presynaptic P2X receptors by pharmacological means, several adenine nucleotides were tested in cultures of dissociated neurons. These experiments were performed in the continuous presence of 100 μmCd2+ to monitor exclusively the secretagogue actions of presynaptic receptors, the signaling mechanisms of which are Cd2+-insensitive (see above). ATP triggered tritium overflow with half-maximal effects at 58 ± 21 μm. 2-Methylthio-ATP stimulated overflow at somewhat higher concentrations, the action being half-maximal at 90 ± 56 μm (p > 0.5 vs ATP). ATPγS was significantly less potent than ATP in triggering tritium overflow and yielded half maximal effects at 303 ± 231 μm(p < 0.05 vs ATP). α,β-Methylene-ATP and β,γ-methylene-l-ATP, agonists at P2X1 receptors (Evans et al., 1995), failed to evoke tritium overflow. ADP and UDP, agonists at G-protein-coupled P2Y receptors of rat SCG neurons (Boehm et al., 1995; Boehm, 1998), also failed to evoke tritium overflow (Fig.4A). Agonist and antagonist sensitivity of presynaptic P2X receptors. After loading with [3H]noradrenaline, neurons were superfused, and subsequent to a 1 hr washout period, 4 min fractions of superfusate were collected. I added 100 μm Cd2+ to the buffer after 50 min of superfusion. At 72, 92, or 112 min of superfusion the indicated concentrations of purinoceptor agonists and/or antagonists were present for 30 sec. 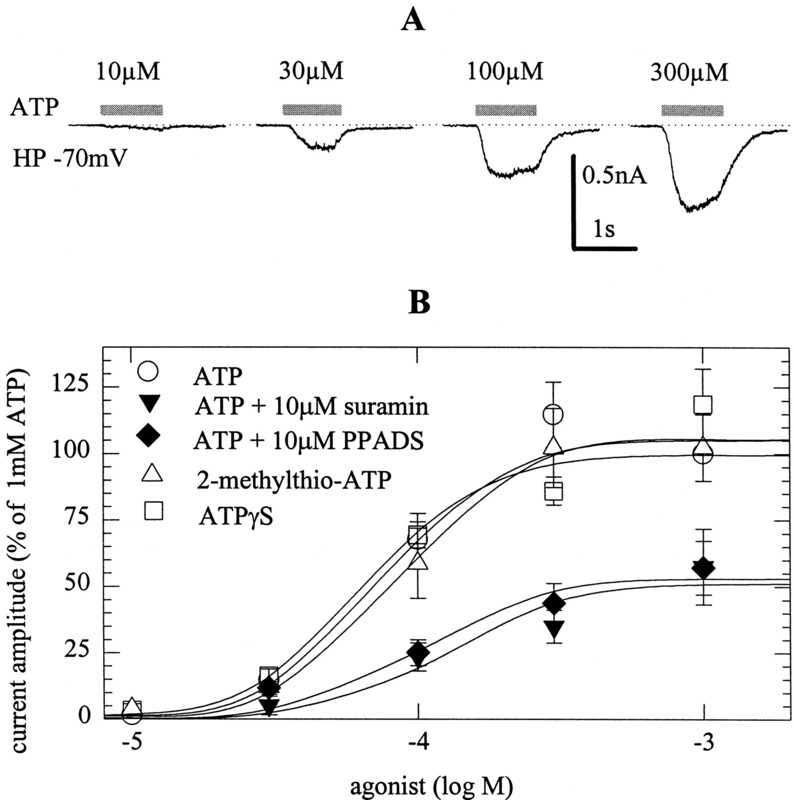 A depicts the concentration–response curves for tritium overflow induced by ATP, 2-methylthio-ATP, ATPγS, α,β-methylene-ATP, β,γ-methylene-l-ATP, ADP, and UDP.n = 6–12, with the exception of ATP, wheren = 29–51. B depicts the concentration–response curves for tritium overflow induced by ATP in either the absence or the presence of 10 or 30 μm suramin or PPADS. n = 7–15, again with the exception of ATP applied alone, where the results of A are shown again. Suramin and PPADS are antagonists at all P2X receptors, with the exception of homomeric P2X4 and P2X6 receptors (Collo et al., 1996). In the present experiments, both antagonists, at 10 and 30 μm, reduced the secretagogue action of ATP in an apparently noncompetitive manner. These results are compatible with the presynaptic ATP receptors being P2X2-like (Collo et al., 1996;North and Barnard, 1997). The P2X receptors located at the somatodendritic region of rat SCG neurons are also believed to be composed of P2X2 subunits (Evans and Surprenant, 1996). To find out whether the somatic P2X receptors display the same pharmacological properties as the presynaptic receptors, inward currents evoked by ATP and analogs were recorded from neuronal cell bodies (Fig. 5). There, ATP, 2-methylthio-ATP and ATPγS were equipotent in causing inward currents, the half-maximal concentrations being 66 ± 10 (ATP), 86 ± 15 (2-methylthio-ATP), and 77 ± 13 μm(ATPγS). ATP-induced currents were antagonized by suramin and PPADS, both at 10 μm, again in a noncompetitive manner (Fig. 5B). Agonist and antagonist sensitivity of somatic P2X receptors. At a holding potential of −70 mV, whole-cell currents were evoked by the application of ATP, 2-methylthio-ATP, or ATPγS, applied either alone or in the continuous presence of suramin or PPADS.A shows original traces of ATP-evoked currents.B depicts concentration–response curves for agonist-induced peak currents, and amplitudes are expressed as percentage of the amplitude obtained with 1 mm ATP in the very same cell; n = 6–7. ATP is co-released together with noradrenaline from postganglionic sympathetic neurons in vivo and in vitro (von Kügelgen et al., 1994b). Therefore, the ATP released in response to electrical field stimulation should activate the presynaptic P2X receptors described above and thereby augment noradrenaline release. Conversely, blockade of these receptors by suramin should reduce stimulation-dependent release. To investigate such a positive feedback modulation, cultures of dissociated neurons were stimulated by electrical fields (180 pulses at 3 Hz) twice, and suramin was present during the second stimulation. In these experiments, Mg2+ was omitted from the superfusion buffer to reduce the activity of nucleotidases which are, on one hand, released from sympathetic nerve terminals (Todorov et al., 1997) and, on the other hand, anchored at the neuronal plasma membrane (Zimmermann, 1996). Nevertheless, under these conditions suramin did not alter electrically evoked [3H]noradrenaline release (Fig. 6). P2X receptors mediate positive feedback modulation of noradrenaline release. After loading with [3H]noradrenaline, neurons were superfused with a Mg2+-free buffer, and subsequent to a 1 hr washout period, 4 min fractions of superfusate were collected. At 72 (S1) and 92 (S2) min, superfusion was stopped, 180 electrical pulses were delivered at 3 Hz, and superfusion was continued thereafter. I included 30 μmsuramin in the buffer 8 min before the second stimulation in the cultures represented by hatched bars. Where indicated, cultures had been treated with pertussis toxin (100 ng/ml for 24 hr), and the buffer contained 2 mmMg2+ and 100 μm Evans blue, respectively; n = 6. Levels of significances of the differences between results obtained in either the presence or the absence of suramin are indicated. Previously, transmitter release from sympathetic nerve terminals has been shown to be augmented in the presence of suramin, which prevents the activation of presynaptic G-protein-coupled P2 receptors by endogenous ATP. This feedback inhibition was attenuated by pertussis toxin (von Kügelgen et al., 1993). Therefore, the above experiments were repeated with cultures treated with pertussis toxin (100 ng/ml for 24 hr) to inactivate the signaling mechanisms of inhibitory presynaptic receptors (see Boehm and Huck, 1997, for an overview). In these cultures, suramin (30 μm) applied in a Mg2+-free buffer reduced electrically evoked noradrenaline release by 9.8 ± 1.8% (Fig. 6). These experiments were repeated in a buffer containing Mg2+ and supplemented with Evans blue (100 μm), which inhibits nucleotidases without causing a pronounced blockade of P2X receptors (Bültmann et al., 1995). 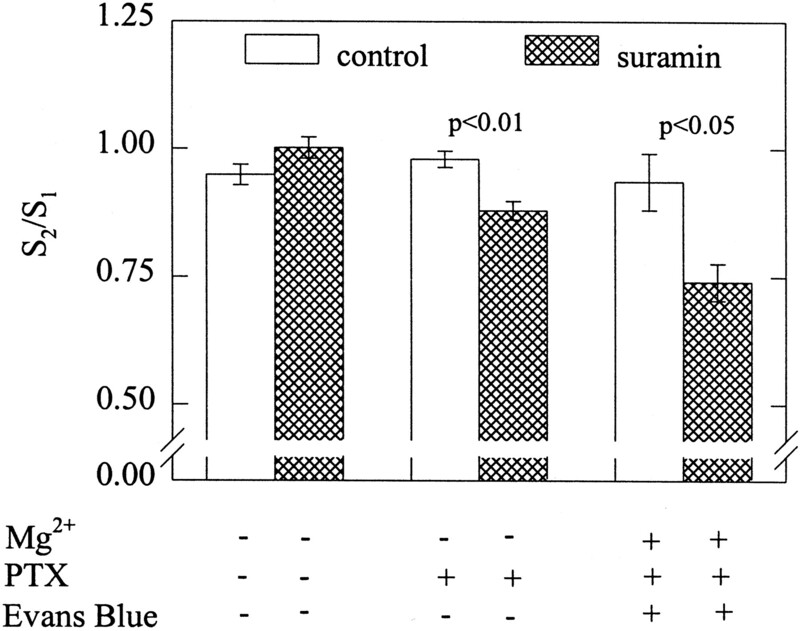 Under these conditions, suramin reduced evoked transmitter release by 21.0 ± 3.7% (Fig. 6). Hence, when nucleotidase activity is antagonized and the signaling of inhibitory presynaptic P2Y receptors is inactivated, a positive feedback modulation of transmitter release from sympathetic nerve terminals mediated by presynaptic P2X receptors can be detected. Members of the family of P2X receptors are widely distributed throughout the nervous system (Collo et al., 1996; North and Barnard, 1997), and excitatory synaptic transmission involving the release of endogenous ATP has been described in central and peripheral neurons (Edwards et al., 1992; Evans et al., 1992). These results established P2X receptors as important postsynaptic elements. Much less is known about presynaptic P2X receptors, although presynaptic ligand-gated ion channels are generally believed to be important components in neuronal function (McGehee and Role, 1996). Although ATP has been demonstrated to evoke the release of various transmitters in the central (Zhang et al., 1996) as well as peripheral (Boehm, 1994) nervous systems, its site of action has not been established, and evidence for release-stimulating presynaptic P2X receptors has been lacking. Most recently, ATP was found to enhance glutamate release at spinal cord synapses through a presynaptic site of action (Gu and McDermott, 1997). The present results demonstrate the existence of presynaptic release-regulating P2X receptors in the peripheral nervous system by showing that ATP triggers noradrenaline release from rat SCG neurons via ionotropic receptors that are located in close proximity to the sites of transmitter release. In cultures of dissociated SCG neurons, ATP-triggered noradrenaline release was abolished in the absence of extracellular Ca2+, but was only partially reduced by either TTX- or Cd2+. Furthermore, the TTX-insensitive component of ATP-evoked noradrenaline release was not affected by Cd2+. These results permit the following conclusions. (1) The secretagogue action of ATP does not involve metabotropic P2Y receptors that may elevate intracellular Ca2+ concentrations independently of extracellular Ca2+ (North and Barnard, 1997), but rather ionotropic P2X receptors. (2) ATP triggers action potentials that propagate along axons to cause presynaptic Ca2+entry via voltage-gated Ca2+ channels and concomitant transmitter release. (3) After blockade of action potentials by TTX, the Ca2+ required for ATP-evoked transmitter release enters the neurons via P2X receptors that are highly Ca2+ permeable (Rogers et al., 1997), and not via voltage-gated Ca2+ channels. (4) The P2X receptors that mediate the Ca2+ entry required for exocytosis must be located in close proximity to the sites of transmitter release: vesicle exocytosis requires Ca2+ concentrations in the submillimolar range (Heidelberger et al., 1994), and because of limited diffusion of Ca2+ ions in neurons, such concentrations are restricted to the sites of transmembrane Ca2+ entry (Augustine and Neher, 1992). Taken together, the receptors that mediated ATP-evoked transmitter release in the presence of TTX or Cd2+ are presynaptic ATP-gated ion channels. Evidence for a direct action of ATP on presynaptic sites was also obtained in pure “axonal” preparations. There, ATP raised intraaxonal Ca2+ and triggered noradrenaline release, and both actions were not affected by Cd2+. Hence, transmembrane Ca2+ entry occurred again via Ca2+-permeable P2X receptors adjacent to the sites of exocytosis. In a preparation containing axons, but not the somata, of dorsal root ganglion neurons, ATP-stimulated glutamate release is reduced, but not abolished, by lidocaine, which blocks voltage-gated Na+ channels and by La3+ which blocks voltage-gated Ca2+ channels (Gu and MacDermott, 1997). Hence, in that preparation, ATP elicits action potentials that propagate along axons, invade and depolarize axon terminals, and finally cause Ca2+ entry via Ca2+ channels with concomitant transmitter release. The receptors mediating these lidocaine- and La3+-sensitive effects are not presynaptic, but preterminal receptors, i.e., receptors located at axons. On the other hand, the receptors involved in La3+-insensitive ATP-dependent glutamate release represent presynaptic P2X receptors (Gu and MacDermott, 1997). Similar results have recently been obtained in brainstem neurons, where the ATP-dependent enhancement of glutamate release was largely reduced by TTX and abolished by Cd2+ (Khakh and Henderson, 1998). In summary, these latter data demonstrated a predominant role of preterminal P2X receptors in the CNS, whereas the present results identified functional presynaptic P2X receptors in the sympathetic nervous system. Rat SCG neurons possess two types of nucleotide receptors that both trigger noradrenaline release: one is a ligand-gated ion channel activated by ATP and 2-methylthio-ATP (Boehm, 1994; Boehm and Huck, 1997), the other one is a G-protein-coupled receptor activated by uridine nucleotides and ADP (Boehm et al., 1995; Boehm, 1998). Activation of P1 purinoceptors (i.e., adenosine receptors), in contrast, does not affect transmitter release from SCG neurons in primary cell culture (Boehm, 1994). In the presence of Cd2+, UDP and ADP failed to induce transmitter release, whereas ATP, 2-methylthio-ATP, and ATPγS exerted pronounced secretagogue actions. Furthermore, the secretagogue action of ATP was attenuated by 10 μm suramin or PPADS, whereas the uridine nucleotide-preferring P2Y receptors are not blocked at these antagonist concentrations (Boehm, 1998). Thus, the presynaptic release stimulating nucleotide receptor was a P2X, and not the P2Y, receptor subtype present in rat SCG neurons. Transcripts for at least four different members of the P2X receptor family have been detected in rat SCG neurons, namely P2X1, P2X2, P2X4, and P2X6 (Collo et al., 1996). One may discriminate between homomeric receptors formed by these subunits by pharmacological criteria. The P2X1 receptor is characterized by its sensitivity toward α,β-methylene-ATP, and the P2X4 and P2X6 receptors are characterized by their insensitivity toward suramin and PPADS (Collo et al., 1996). Like other ionotropic receptors, P2X subunits may form multimers, namely trimers (Nicke et al., 1998). Recently, heteropolymers containing P2X4 and P2X6 subunits were found to be blocked by suramin and PPADS, but these receptors were activated by α,β-methylene-ATP (Le et al., 1998). As the presynaptic receptor that triggered Cd2+-insensitive transmitter release was not activated by α,β-methylene-ATP and blocked by suramin and PPADS, this receptor unequivocally displays pharmacological features of P2X2 receptors (Collo et al., 1996; North and Barnard, 1997). The pharmacological characteristics of the presynaptic receptors were compared with those of somatic P2X receptors identified by patch-clamp recordings of inward currents evoked by adenine nucleotides. At the presynaptic release-stimulating receptor, the rank order of agonist potency was ATP ≥ 2-methylthio-ATP > ATPγS, whereas all three agonists were equipotent in causing inward currents at neuronal somata. In particular, ATPγS was fourfold more potent in causing inward currents through somatodendritic receptors than in triggering noradrenaline release via presynaptic receptors. These results suggest that the presynaptic P2X receptors may be different from somatodendritic ones. One should bear in mind, however, that the somatic P2X receptors were analyzed by ionic currents as a direct measure of receptor function, whereas the presynaptic receptors were characterized by their secretagogue action. In the latter case, mechanisms other than P2X receptor activation may also contribute to the concentration–response curves obtained. For instance, the hydrolysis-resistant nucleotide ATPγS may potently activate release inhibiting presynaptic P2Y receptors (see below and von Kügelgen et al., 1994a). This action might counteract the secretagogue effect of ATPγS and thereby lead to an apparent decrease in potency. Thus, the pharmacological difference between presynaptic and somatic P2X receptors of SCG neurons described above needs to be corroborated either by additional experiments with subtype-selective ligands or by immunostaining with subtype-specific antibodies. ATP and noradrenaline are released as cotransmitters at sympathoeffector junctions (von Kügelgen and Starke, 1991). Hence, endogenously released ATP might activate the presynaptic P2X receptors located directly at the sites of transmitter release to mediate a feedback modulation. This assumption was verified by the finding that suramin reduced electrically evoked noradrenaline release from SCG neurons in vitro. However, this effect could only be observed in neurons treated with pertussis toxin, which inactivates the signaling mechanisms of inhibitory presynaptic receptors in SCG neurons (Boehm and Huck, 1997). This corroborates the idea that sympathetic transmitter release is negatively controlled by ATP acting at P2Y receptors (von Kügelgen et al., 1994a). Thus, sympathetic nerve terminals may be equipped with two types of presynaptic ATP receptors: inhibitory G-protein-coupled P2Y receptors and stimulatory ionotropic P2X receptors. A similar situation has been described for the neuromuscular junction where presynaptic nicotinic receptors mediate positive, and presynaptic muscarinic receptors mediate negative feedback. Whereas the nicotinic receptors are believed to serve as a presynaptic amplifier that guarantees efficient neuromuscular transmission during neuronal activity, the muscarinic receptors are viewed as a safety device that may limit the positive feedback mechanism to prevent overstimulation (Wessler, 1992). The presynaptic P2X and P2Y receptors at the sympathoeffector junction may subserve a similar function as the presynaptic acetylcholine receptors at the neuromuscular junction. The study was supported by the Jubiläumsfonds derÖsterreichischen Nationalbank (# 6821) and the Austrian Science Foundation (FWF; P12997-MED). I am indebted to G. Koth, A. Motejlek, and K. Schwarz for perfect technical assistance and to Drs. M. Freissmuth and S. Huck for valuable comments on this manuscript. Correspondence should be addressed to Stefan Boehm, Department of Neuropharmacology, University of Vienna, Waehringerstrasse 13a, A-1090 Vienna, Austria. (1992) Neuronal Ca2+ signalling takes the local route. Curr Opin Neurobiol 2:302–307. (1994) Noradrenaline release from rat sympathetic neurons evoked by P2-purinoceptor activation. Naunyn Schmiedebergs Arch Pharmacol 350:454–458. (1998) Selective inhibition of M-type K+ channels in rat sympathetic neurons by uridine nucleotide preferring receptors. Br J Pharmacol 124:1261–1269. (1997) Somatostatin inhibits excitatory transmission at rat hippocampal synapses via presynaptic receptors. J Neurosci 17:4066–4075. (1995) α2-Adrenoceptor mediated inhibition of acetylcholine-induced noradrenaline release from rat sympathetic neurons: an action at voltage-gated Ca2+ channels. Neuroscience 69:221–231. (1997) Receptors controlling transmitter release from sympathetic neurons in vitro. Prog Neurobiol 51:225–242. (1991) Electrically evoked noradrenaline release from cultured chick sympathetic neurons: modulation via presynaptic α2-adrenoceptors and lack of autoinhibition. Naunyn Schmiedebergs Arch Pharmacol 344:130–132. (1995) UTP- and ATP- triggered transmitter release from rat sympathetic neurons via separate receptors. Br J Pharmacol 116:2341–2343. (1997) Glycine receptors in cultured chick sympathetic neurons are excitatory and trigger neurotransmitter release. J Physiol (Lond) 504:683–694. (1983) Slow cholinergic excitation - a mechanism for increasing neuronal excitability. Trends Neurosci 6:302–307. (1996) An antagonist-insensitive P2X receptor expressed in epithelia and brain. EMBO J 15:55–62. (1995) Functional consequences of inhibition of nucleotide breakdown in rat vas deferens: a study with Evans blue. Naunyn Schmiedebergs Arch Pharmacol 351:555–560. (1996) Cloning of P2X5and P2X6 receptors and the distribution and properties of an extended family of ATP-gated ion channels. J Neurosci 16:2495–2507. (1993) Action of purine and pyrimidine nucleotides on the rat superior cervical ganglion. Br J Pharmacol 110:1297–1304. (1978) Simultaneous analysis of families of sigmoidal curves: application to bioassay, radioligand assay, and physiological dose-response curves. Am J Physiol 235:97–102. (1996) P2X receptors in autonomic and sensory neurons. Semin Neurosci 8:217–223. (1992) ATP mediates fast synaptic transmission in mammalian neurons. Nature 357:503–505. (1995) Pharmacological characterisation of heterologously expressed ATP-gated cation channels (P2X purinoceptors). Mol Pharmacol 48:178–183. (1997) Activation of ATP P2X receptors elicits glutamate release from sensory neuron synapses. Nature 389:749–753. (1992) Transmission at autonomic neuroeffector junctions. Trends Neurosci 15:40–46. (1992) Dihydropyridine-sensitive and -conotoxin-sensitive calcium channels in a mammalian neuroblastoma-glioma cell line. J Physiol (Lond) 448:161–188. (1998) ATP receptor-mediated enhancement of fast excitatory neurotransmitter release in the brain. Mol Pharmacol 54:372–378. (1997) P2-receptor-mediated inhibition of noradrenaline release in the rat hippocampus. Naunyn Schmiedebergs Arch Pharmacol 355:707–715. (1997) Modulation by neurotransmitters of catecholamine secretion from sympathetic ganglion neurons detected by amperometry. Proc Natl Acad Sci USA 94:1506–1511. (1998) Central P2X4 and P2X6 channel subunits coassemble into a novel heteromeric ATP receptor. J Neurosci 18:7152–7159. (1989) Laminin and a basement membrane extract have different effects on axonal and dendritic outgrowth from embryonic rat sympathetic neurons in vitro. Dev Biol 136:330–345. (1997) NMDA-receptor regulation of substance P release from primary afferent nociceptors. Nature 386:721–724. (1996) Presynaptic ionotropic receptors. Curr Opin Neurobiol 6:342–349. (1998) Presynaptic receptors. Annu Rev Pharmacol Toxicol 38:201–227. (1993) Block by calcium of ATP-activated channels in pheochromocytoma cells. J Gen Physiol 101:377–392. (1997) Nucleotide receptors. Curr Opin Neurobiol 7:346–357. (1993) Sites of transmitter release and relation to intracellular Ca2+ in cultured sympathetic neurons. Neuroscience 52:973–986. (1997) Calcium flux through predominantly independent purinergic ATP and nicotinic receptors. J Neurophysiol 77:1407–1417. (1993) Cyclic AMP modulates but does not mediate the inhibition of [3H]norepinephrine release by activation of alpha-2 adrenergic receptors in cultured rat ganglion cells. Neuroscience 52:107–113. (1997) Cloned ligand-gated channels activated by extracellular ATP (P2X receptors). J Membr Biol 160:91–100. (1983) Monoclonal antibodies distinguish phosphorylated and nonphosphorylated forms of neurofilaments in situ. Proc Natl Acad Sci USA 80:6126–6130. (1966) A study of the inhibitory action of γ-aminobutyric acid on neuromuscular transmission in the crayfish. J Physiol (Lond) 183:418–432. (1997) Neuronal release of soluble nucleotidases and their role in neurotransmitter inactivation. Nature 387:76–79. (1997) Studies on the release and extracellular metabolism of endogenous ATP in rat superior cervical ganglion: support for neurotransmitter role of ATP. Neuroscience 79:893–903. (1991) Noradrenaline-ATP co-transmission in the sympathetic nervous system. Trends Pharmacol Sci 12:319–324. (1993) Axon terminal P2-purinoceptors in feedback control of sympathetic transmitter release. Neuroscience 56:263–267. (1994a) P2-purinoceptor-mediated autoinhibition of sympathetic transmitter release in mouse and rat vas deferens. Naunyn Schmiedebergs Arch Pharmacol 349:125–132. (1994b) Co-release of noradrenaline and ATP from cultured sympathetic neurons. Neuroscience 61:199–202. (1996) Differential distribution of two ATP-gated ion channels (P2X receptors) determined by immunocytochemistry. Proc Natl Acad Sci USA 93:8063–8067. (1992) Acetylcholine at motor nerves: storage, release, and presynaptic modulation by autoreceptors and adrenoceptors. Int Rev Neurobiol 34:283–384. (1985) Identification and localization of synaptophysin, an integral membrane glycoprotein of Mr 38,000 characteristic of presynaptic vesicle. Cell 41:1017–1028. (1997) Presynaptic inhibition of elicited neurotransmitter release. Trends Neurosci 20:204–212. (1996) ATP induces release of newly synthesized dopamine in the rat striatum. Neuroscience 28:395–400. (1996) Biochemistry, localization and functional roles of ecto-nucleotidases in the nervous system. Prog Neurobiol 49:589–618.